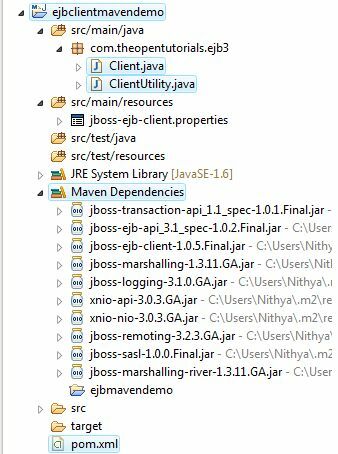 In Part 1 of this tutorial, we saw how to develop and deploy EJB in JBoss AS using Maven in Eclipse. 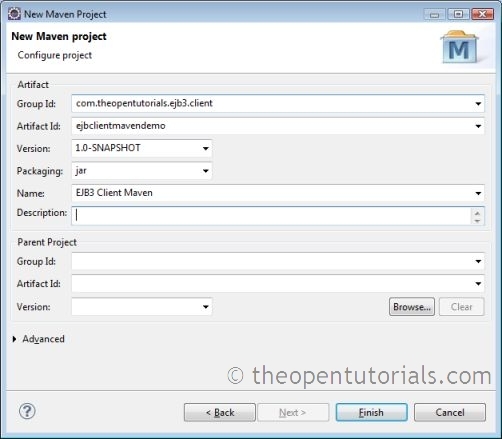 In this EJB Maven tutorial we will see how to develop and run the EJB client (using Maven) to access the ejb. Select Maven Project and click Next. This screen prompts for project workspace location. Make sure “Use default Workspace location” and “Create a simple project (skip archetype selection)” are selected and click Next. Now we have to configure the project by entering the following details and click Finish. Copy paste the following code. Now create another Java class “Client” in the same package and copy the following code. Copy paste the following in your pom.xml file. The maven-compiler-plugin is used to compile the sources of your project. We specified jdk 1.6 version for source and target classes. Since our ejb client is a Java program, to run it we use the exec-maven-plugin which helps to execute system and Java programs. We need to specify the executable (i.e. java), classpath, and the java class (com.theopentutorials.ejb3.Client). The classpath is left empty because the plugin includes the necessary classpath arguments based on the dependencies provided. We depend on the EJB remote business interfaces of this application to run the client. So we need to specify the ejb client jar dependency. The <type> tag with value “ejb-client” is used to specify this project’s dependency on the EJB client jar. The dependencies jboss-transaction-api_1.1_spec, jboss-ejb-api_3.1_spec, jboss-ejb-client, xnio-api, xnio-nio, jboss-remoting, jboss-sasl, jboss-marshalling-river have scope as runtime because these are all not required for compilation. 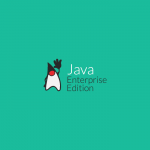 The dependencies jboss-javaee-6.0 and jboss-as-ejb-client-bom under dependencyManagement have scope as import which is used to include dependency management information from a remote POM into the current project. These remote POMs are provided by JBoss which contains the necessary dependencies for running the client. If there are no errors, you should see the following output.